Almost everything about this disc is first rate. The playing of the musicians is outstanding throughout. The brass and drums in the big moments of 110 and 63 are thrillingly martial, the strings give outstanding support throughout and the frequent instrumental solos are superb. A special mention, in this regard, should go to the flute in the opening movement of Süβer Trost, which is really delightful, spinning a web of peace over the lullaby of the first movement. The keening oboe sound in the first duet of 63 is also outstanding. Pierlot conducts all three cantatas with a beat that pulses with life, and his speeds are judged just right - neither too fast nor too slow. The singers are excellent, too, and all get fully inside the period sound. I particularly liked the fruity tenor of Julian Prégardien and the ethereal counter-tenor of Carlos Mena. Stephan MacLeod sings the bass arias with a French inflection that is by no means unwelcome, and Maria Keohane’s soprano lends a bright air of innocence to all she sings. It helps, too, that Mirare’s recording quality is nothing short of sensational. The studio sound is close and personal while retaining just the right amount of space. The small group of musicians and even smaller group of singers, combined with the skill of the engineers, helps you to hear right through the text, as though Pierlot were shining a light that illuminates the whole thing from the inside out. My only problem is with the choruses. Now is not the place to rehearse the arguments for and against the one-to-a-part approach to singing Bach: all I can say is that I don’t really like it. The biggest, most celebratory moments of the cantatas are the opening choruses of 110 and the opening and closing choruses of 63, and I’m sorry to say that here they pass for very little. Yes, the transparency and clarity of line is there for all to hear, and if you like one-to-a-part Bach then this disc will probably take its place at the very top of recommendations for these works. However, I missed the rush of exhilaration that a bigger chorus brings to both ends of 63, and the festive buoyancy of 110 is diluted when there are only four people singing. For that reason, I can’t completely recommend this disc over the likes of Gardiner and Suzuki. Nor, especially, Philippe Herreweghe’s excellent recording of these same works with his Collegium Vocale Ghent, which not only has a bigger chorus - hence a greater scale - but also fully embraces the grand ceremonial aspects of these works with a touch of swagger that I find utterly winning. However, many level heads will point out that the chorus sings on very few tracks on this disc and that, consequently, it’s not worth ruling the disc out on their account. 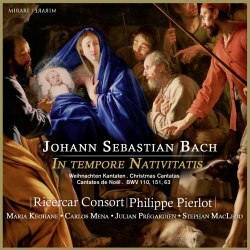 They are correct, and if you can live with the reduced chorus then you’ll find this disc a real festive delight.